The Third battle of Panipat 13 January 1761. Ahmad Shah Durrani rides a brown horse, on the left, Najib Khan and Shuja-ud-Daula, on the right are Ahmad Khan Bangash and Hafiz Rahmat Khan, and before them a cavalry attack is made by Shah Wali Khan. A wounded Sadashivrao Bhau is being helped on the horse. 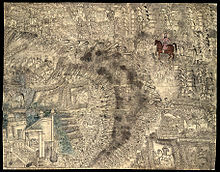 The Third Battle of Panipat took place on 14 January 1761, at Panipat, about 60 miles (97 km) north of Delhi between a northern expeditionary force of the Maratha Empire and a coalition of the King of Afghanistan, Ahmad Shah Abdali with two Indian Muslim allies—the Rohilla Afghans of the Doab, and Shuja-ud-Daula, the Nawab of Awadh. Militarily, the battle pitted the French-supplied artillery and cavalry of the Marathas against the heavy cavalry and mounted artillery (zamburak and jizail) of the Afghans and Rohillas led by Ahmad Shah Durrani and Najib-ud-Daulah, both ethnic Afghans (the former is also known as Ahmad Shah Abdali). The battle is considered one of the largest fought in the 18th century, and has perhaps the largest number of fatalities in a single day reported in a classic formation battle between two armies. About ninety thousand persons, male and female, were taken prisoners, and obtained the eternal happiness by embracing the Muhammadan faith. Indeed, never was such splendid victory achieved from the time of Amir Mahmud Subuktigin. Shah Waliullah in his appeal for help from the Afghan King Ahmed Shah Abdali; Dr. Sayed Riaz Ahmad in his book Maulana Maududi and Islamic state, Lahore People's Publishing House, page 15 - 1976. What, have I come from the south relying on your strength? I will do what I like. You may stay here or go back to your own place. After overthrowing the Abdali, I shall come to reckoning with you. Whither would you run, friends, your country is far from here. Shah Wali, Ahmed Shah's Prime Minister vainly trying to rally the courage of his followers, of whom many were in full retreat during the Marathas initial charge. Two pearls have been dissolved, 27 gold coins have been lost and of the silver and copper the total cannot be cast up. This page was last edited on 15 October 2018, at 06:42.